An intriguing statement on the surface. Now this topic can lead away to tons of discussions, some of which I’ll be later covering on future articles. But lets get to the bottom-line of this statement, statements can build and break walls in a society deemed to push its boundaries for certain causes. An important message relays in this, and so I ask are we really offended by swear words of what others say to us or that of which we hear than that of a six year old who is starving in Africa? According to UNICEF, more than 132 million children have been classified as orphans, meaning they lost one or both parents. According to The Water Project, nearly 1 billion people in the developing world do not have access to clean drinking water. Water, land and air are getting increasingly polluted, water tables are falling, soil erosion is leading to desertification, global warming is well underway, and species are dying out 1000 times faster than their natural rate of extinction. So why in this day and age, in the culture we live in people are more offended by breast feeding mothers than women showing cleavage down to their belly buttons. People are so focused on their everyday lives, that they have forgotten other things that are supposed to be more important. Certain individuals and groups are always more upset by the violation of their folk customs than they are by moral failings until they’re themselves are victims of a aforementioned famine, warfare and environmental disasters – then they will wake up. Although I’m offended by both these things, I wont be a hypocrite and say I’m an activist or to either be one. To me one term is offensive, the other is unconscionable, its like comparing apples to coffins…that’s when it hits you that you are now living in what seems like a disposable world. It shouldn’t bother me that people are swearing or using the middle finger. It comes out of their mouths not mine, however is it not offensive when people don’t give a crap about the welfare of our people and this planet. Especially when they say things like “As long as I’m not around when it turns bad It doesn’t concern me” ever thought about the children or the future generations that are to come. But what are we actually doing about it, or are you going to turn into an activist all of a sudden because you didn’t want a certain tree in a forest to be cut down, however there are other ways we could work to eliminate famine and destruction of our environment than focus on who used the middle finger. What’s the reason we can’t have civility and environmental responsibility, instead of being worried about which neighbour foul- mouthed the other or the fact you didn’t like a certain movie because it contained a lot of B* words. Just look at all the endless distractions we pay attention to which is a great way to remain asleep and miss the real issues at hand, but then there is always a deeper issue to this. We are always blaming corporations and businesses to what’s going on in this world, and therefore it arises the view that its their issue and their responsibility to erase famine and help the environment and not yours. What are the people on top trying to do about it. If we let the corporations get their evil deeds done the resulting catastrophes will serve to rally us against them therefore creating a revolution that by necessity shucks the corporate greed paradigm in favour of common sense solutions like green energy, localized farming and a foreign policy shift of recognizing sovereign rights and which pursues peace; where diplomacy is the only solution to conflict and trade sanctions that starve the poorest and do nothing to the rich in power are illegal. Although this requires everything to be done at the higher level its ordinary people like us that need to get things moving in order to bring a change instead we are fast asleep and pay heed to the issues that don’t really matter, like swearing or being offended by the way another behaves around us is more important apparently. 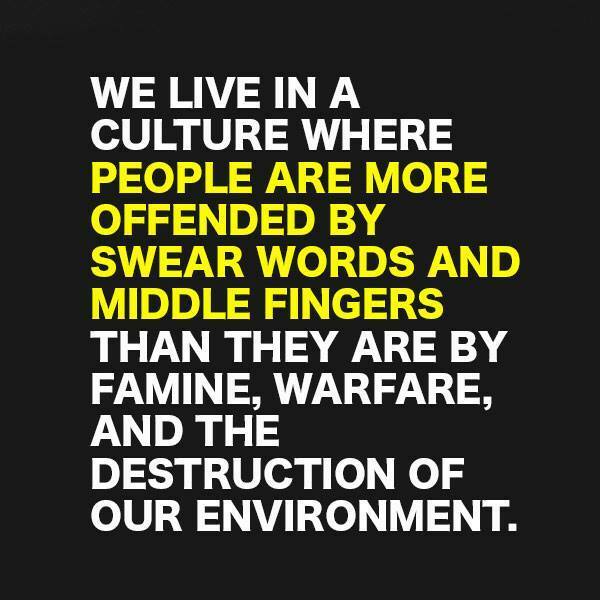 Swearing is much more visible as it is so accepted in society these days, remember the society is changing rapidly. The only way we could achieve some change and teach people the core values of the most important things in life is to curb morality at home in hopes of making a difference and teaching the youth the proper way to speak and behave, to make hope as a responsibility for long time.